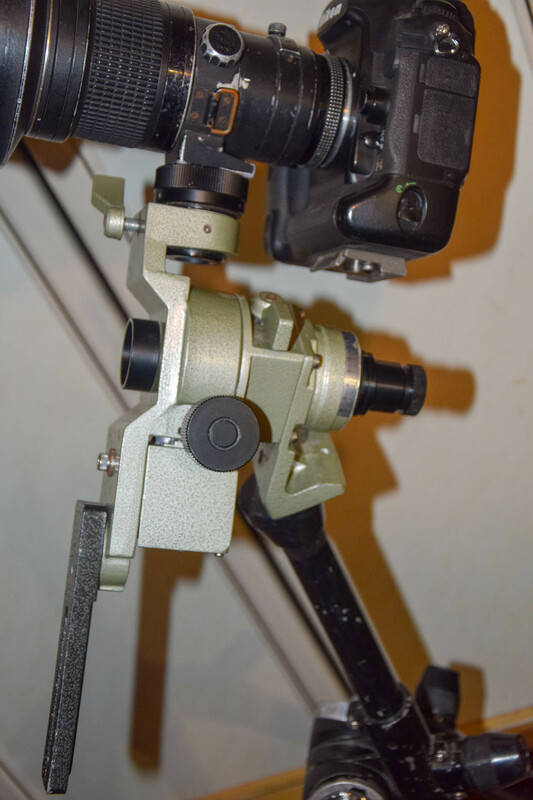 Another amazing thing happened today, another good friend asked me if I could use a 15º per hour motor drive... My brain wasn't switched on enough for the penny to drop, after a bit of calculating I realised it was an equatorial mount, he has no use for it and though I might have. The price? 50 paving blocks for his driveway, of which I have almost 3,800, glad to be rid of a few! There has to be a but... It's old, it appears complete, amazingly with a genuine Benbo ball head. Unfortunately the multi core lead which uses a dinse? 8 pin plug and socket has been broken from the plug, so I will need to identify the connections, pinouts, in order to re-connect it. 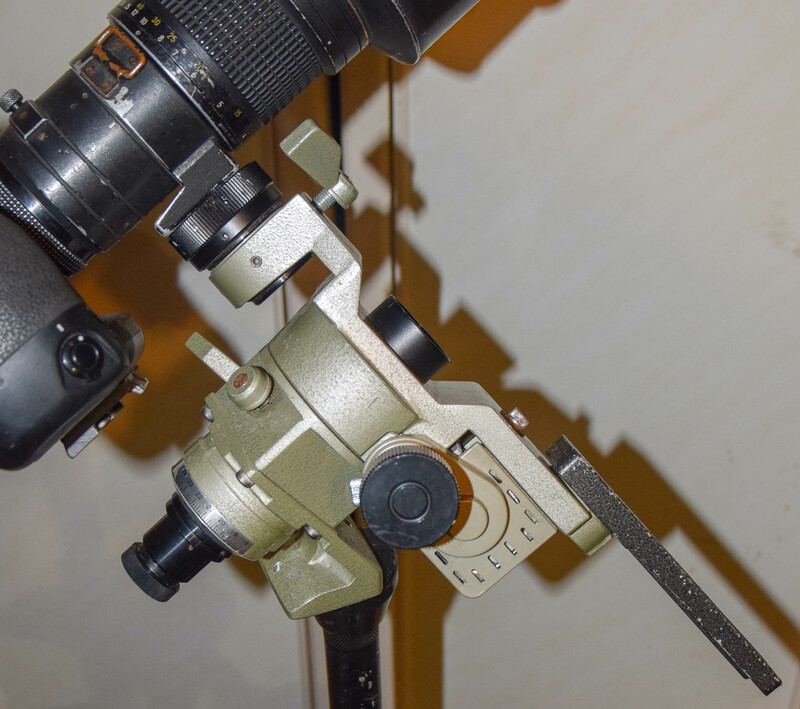 It has a Polar scope, which is central on the axis of the rotation. 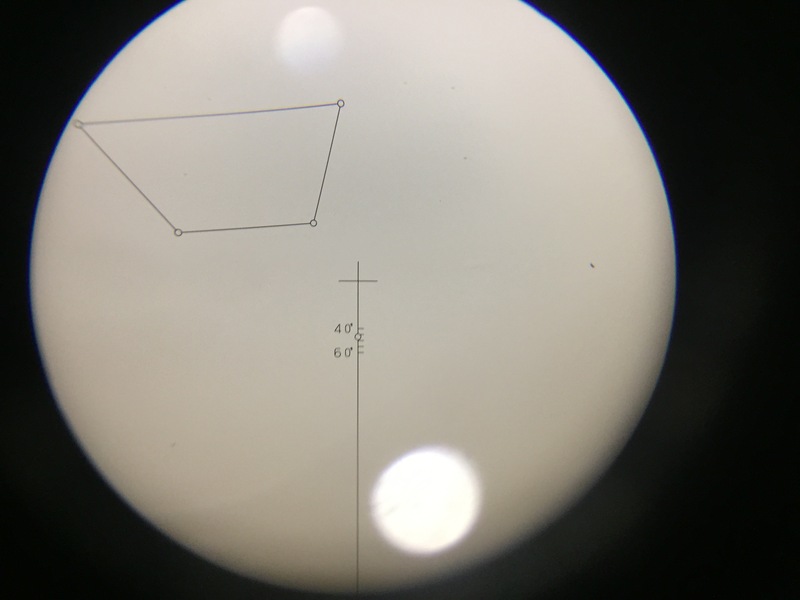 It's hard to view through it because there is a lever in the way but it appears to be etched with the four Ursa Major stars, and some other markings, a central cross, 40' 60' with 5 tic marks and a circle on the line. which I assume you target on Polaris. It doesn't have a right angle adaptor like the one Øivind's mount in another thread. It weighs about 3 Kg, without the electrics. There is a control box with X1 - X2 switch and some buttons, hard to read the lettering. I have quickly searched for info but can't find anything specific, I suspect it's a very old model, the motor driver is Quartz controlled. Any comments or suggestions will be most welcome, I don't want to mess it up, or damage it. The right angle finder on my SkyTracker polar scope is a Nikon DR-3 (about $25 on ebay, a little more for DR-4 ) which I made an adapter for. 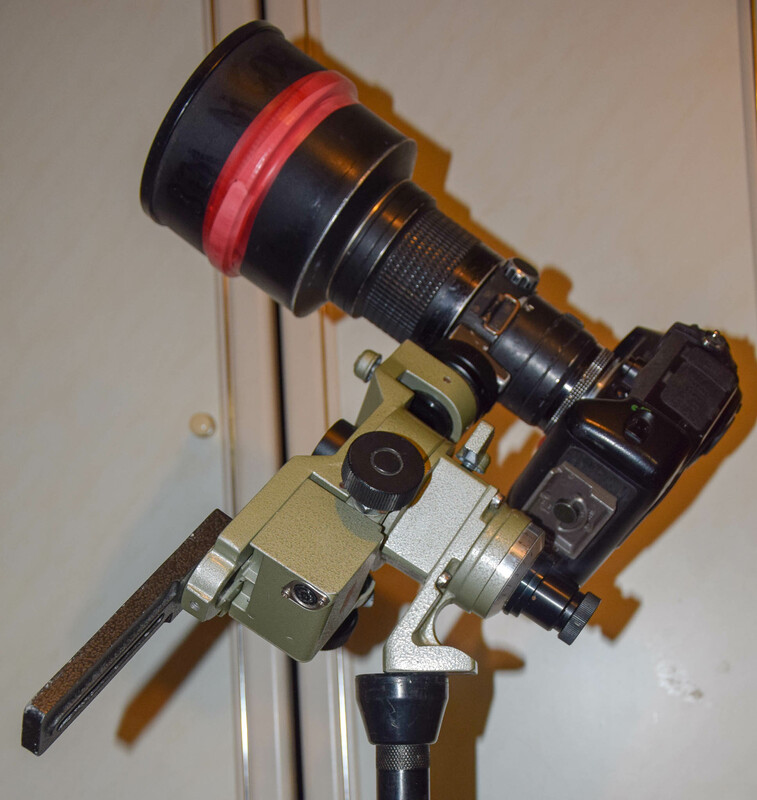 A modified Nikon DK-22 provided the threads for the adapter that the DR-3 screws into. 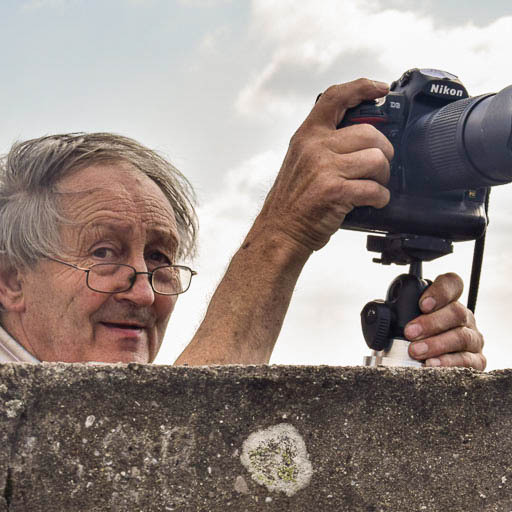 Many thanks for that Øivind, I will check out the links and the right angle finder would be very useful. I am a bit puzzled about the aiming scope, looking through it in the house I see the etched markings but taking it outside tonight, reasonably dark, I see the stars but not the (black) etched markings. Is there any way to illuminate the scope or is it OK when you get the mount on a tripod? The Skytracker polar scope has an opening for a red LED that resides in the tracker to illuminate the reticle. My brother has a little Vixen Polarie, and one of the issues he has is illuminating the reticle of the polar scope. He uses a hand held red LED touch to shine into the polar scope front at an angle. If you search a little, you will find companies that sell an illuminator that attaches to the front of the polar scope, or one could easily put something simple together that will stay put at the front, just a red LED, a resistor, a battery and a switch is all that is needed. The LED does not need to be very powerful. Ah, OK that makes sense. I think I have identified the pinout colours for the plug, I will check them again but I'm pretty sure now. Sorry, I've been immensely busy recently. This appears to be an earlier version than the Vixen 'Super' head which Øivind kindly gave me the link for. Here with my D3 and 300mm f/2.8. I have posed questions on Cloudy Nights forum but no response as yet. I have managed to re connect the 8 pin plug but the controller doesn't seem to come live when power is applied. I am using a bench power supply which should power it up perfectly. I would prefer to get it working with the existing motor but if needs be I will convert to Stepper, it will be good enough for what I need. This is the motor and controller, which both appear to be in good order. I removed the motor from it's housing to have it's photo taken. I believe the controller has some component failure, maybe a capacitor gone bad? The connections appear good, the PCB appears good, I have by-passed the inlet DC connector which is somewhat corroded with no response, the LED indicator does not light up, I inadvertently reversed the polarity briefly and the LED lit up green, when I pressed a movement button the LED turned to red. I have double checked the polarity and I believe I am supplying live to the correct circuit, on the other hand I may be wrong... These are the broken wires in their correct positions. I have machined the camera mount to receive a 3/8" UNC cap screw to mount a heavier ball joint on. I have been assessing the tripod mount with a view to improving the mount along the lines of the 'Super' model. Much sturdier and easier to incline accurately. The previous adjustment must have been very floppy and difficult to adjust with any accuracy. I have also checked out the red illumination for the Polar finder, I have a red LED head torch and held it near the front of the scope, that seems to be all it needs. Vixen did actually provide one as an accessory. Thanks for posting these images, looks like you got yourself some fun figuring out things! I would probably start with dismounting the circuit boards and look for corrosion or areas showing signs of having been too hot. 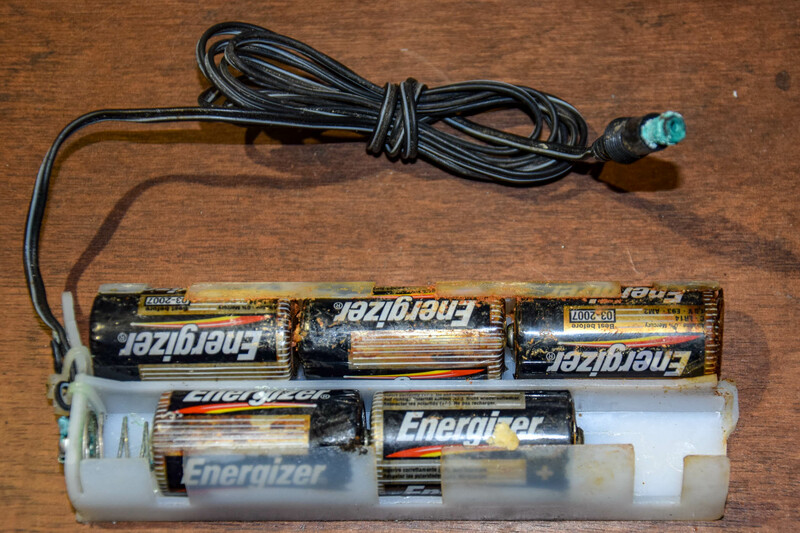 Transistors are often suspicious targets that can be prone to burn out. It should be possible to reverse engineer enough to figure out polarity etc., minus is usually at the ground plane. One should be very careful with connecting polarity in reverse - can easily burn of things unless there is diode protection or designed to take polarity both ways by supplying power though a bridge. Such measures should be easy to spot on the circuit board. Thanks for the comments Øivind. Among other things, I have discovered is the output has 3Kg/cm force available and the rated voltage is 9 to 12 volts. In that case, I may make a battery holder for the EN-EL4 batteries which are 10.8 Volts nominal. That way I have a neat, rechargeable power source. I have a Chinese charger receptacle which could be repurposed as a battery holder/power supply. Having time and a calm environment this evening, I dug out the Volt meter and test leads and investigated the non functioning control unit. I have figured the pinouts for the motor plug correctly, they are as the pinout diagram above. The fault is in the DC input socket in the control box. Perhaps due to corrosion or simply old age. I bypassed the input socket and connected the power supply directly to the internal connections of the motor controller instead of via the actual original socket. The indicator lamp came up green and the motor ran, normal speed, X2, stopped and X16, so I am a very happy bunny. If available current drops below about 500mA the indicator goes red and the motor stops. The input goes directly to a voltage regulator, an L7805CV, which keeps the circuit Voltage to 5.0Volts. The regulator can tolerate up to 35Volts input for a 5Volt output, so I have lots of latitude, a high capacity battery of some sort, seems the order of the day, maybe an EN-EL4, of which I have several now. I need to replace the poor design DC input socket with something more in keeping with the task. Probably a 3 pin Din plug/socket of the same type as the motor plug/socket. This is the PDF diagram for the L7805CV. Congratulations Robert with figuring it out! The 7805 is a very standard linear voltage regulator. With respect to inputting high voltage, keep in mind the heat dissipation of the 7805. If it is used as a standard linear voltage regulator, all the voltage drop goes to heat dissipated by the voltage regulator. However if it is just drives a control board the current draw and thereby heat dissipation is likely not much. As I recall you mentioned a 9-12V rating of the mount and that sounds quite reasonable for connecting a lead-acid 12V battery (16-11V typical range) etc. Some better spring loaded barrel connectors in standard sizes have appeared on the market lately. They are typically marketed for low voltage LED lights. I get them from Digi-Key. Here is the one I got for the super capacitor circuit: https://www.digikey.com/product-detail/en/tensility-international-corp/50-00025/839-1204-ND/3985762; it is designed for embedding, but other solutions are possible. 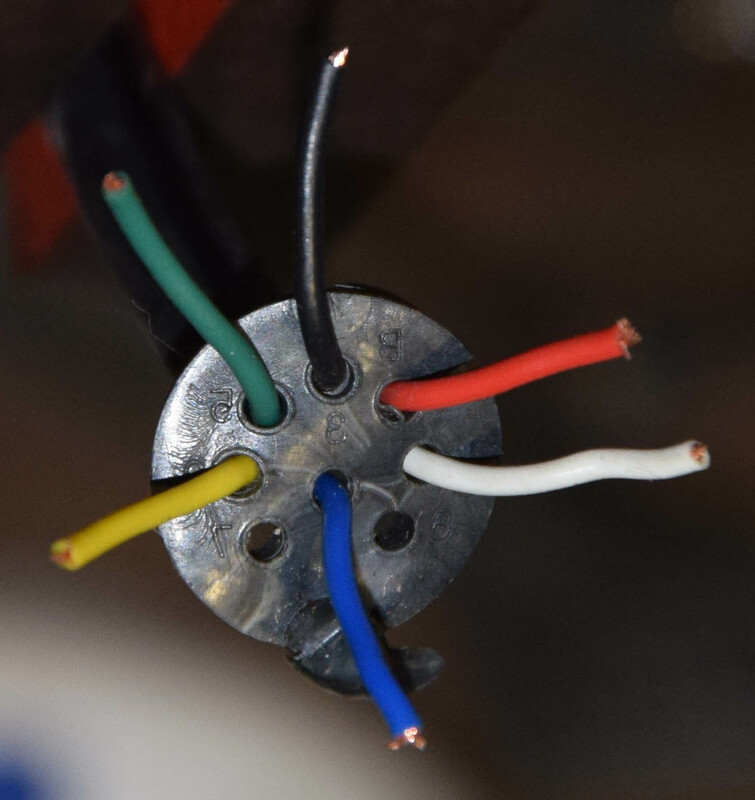 Best to have the plug partly inserted when soldering to keep the pin centered as the plastic materials get soft due to the heating. LM2575 which is a switching type. Will need to add a couple of small components but won’t dissipate as much power. Thanks for that Jack, I will monitor the temps. 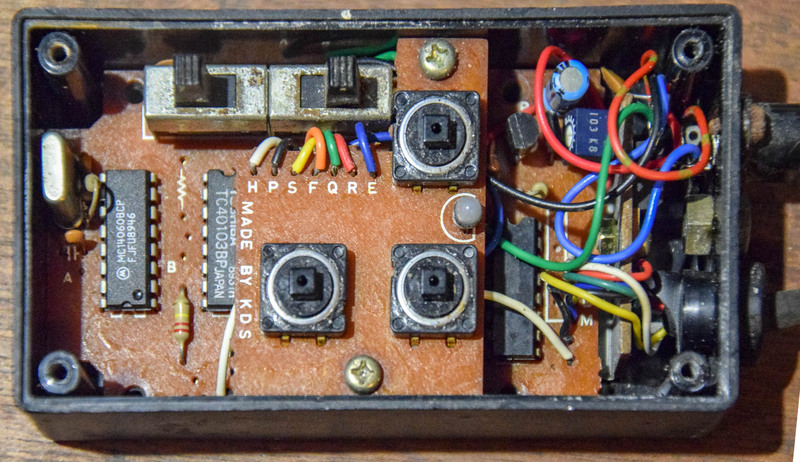 The DC input plug HAD been wired reverse polarity. Yesterday I had bypassed it and that got the motor running, tonight I cleaned the contacts on the plug and tried it again, reassembled properly, no go. Dismantled again and checked it through, eventually I realised it had been wired the wrong way round. The previous owner was a 90 year old (young?) lady who would take it out into her garden and watch and perhaps photograph the stars late at night. There was a genuine, British Benbo Ball head on the mount, so I guess she may well have been using it for photography. It's currently running, I set it off at 22:00 GMT, going to monitor it for an hour or so, see what happens. I think we may have a clear night later in the week, if so I will take it out and give it a try. I really struggled to fit a new DIN 8 pin plug which I got on Sunday, I have arthritis in my hands and struggle with fine control, I was doing well with the first three pins but then I got a blob of solder between two pins. Grrr. Eventually I managed to soak it up with a desoldering tape but it's a bit messy around the inside of the plug now. After 30 minutes it seems to be on time, at least by the stuck on graduations. They may not be calibrated perfectly, at least I can say it's in the ball park, not doing anything silly. The 16X and 2X and North/South controls work as expected. I am currently feeding it from my bench PSU, running at 9.6 Volts and 300mA draw. The PSU Amps needle is flickering very slightly, presumably as a result of the stepper motor switching. I have a portable golf trolly lead acid battery which is good, I will charge it up and prepare it with a small fuse in case of accidents. I still prefer the idea of using a Ni-MH commercial battery like the D3 Battery. 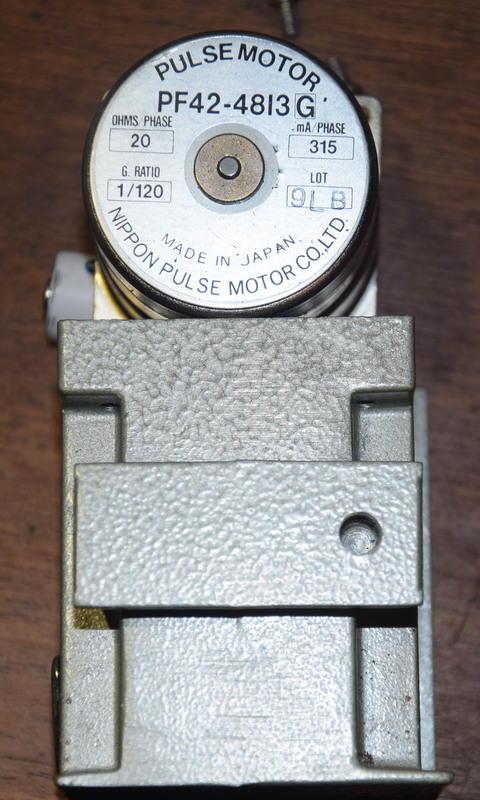 I am also wondering about possibly being able to use a small fibre optic lead to project a tiny red light into the Polar scope, it would be neat and unobtrusive, the Vixen illuminator looks a bit clunky. I have no idea how practical it might be but I got the idea from some Christmas decorations. Update: The controller (outer casing, in vicinity of voltage controller) is running at ~41.1ºC in ambient of 18.5ºC, the motor is running at ~22.5ºC. Still keeping reasonable time, according to the stuck on scales, so no big issues with motor speed. Will be interesting to see how accurate it will be if I can leave it running for full 24 Hrs. I hadn't realised I haven't updated this thread. I started a thread on the Cloudy Nights forum but got into trouble with their admin due to the size of my images. I have also been busy elsewhere and family issues interrupt but this project rumbles on. The test I was reporting on previously was completed and given the limited quality of my testing regime I feel it was a good result. The accuracy of the motor seems to be better than half a second over 24 Hours. Achieved by taking a photograph every 15 minutes, over 24 hours of a radio controlled analogue clock with the camera rotating with the clock. I superimposed the first and last images and checked the position of the second hand and the clock face. It appears I hadn't centred the rotation correctly but the timing was pretty good. The exercise helped me to better understand the practicalities of using an EQ mount. I have done further tests on distant objects and I have concluded the tripod to EQ mount 'wedge' is the crucial component. I didn't have one. I tried using a fairly lightweight but reasonably solid Manfrotto video head but it lacks the ability to lock solid on the elevation and of course the ability to fine adjust the rotation and elevation. I have looked at many examples of EQ wedges and discovered good ones are very expensive. Very expensive isn't on my agenda so I have bought some aluminium stock and have sketched out my design based on numerous examples I have seen online. A large chunk of aluminium is currently chucked up in my lathe, creating a new main support member for the EQ mount which will swivel in a very solid base and provide fine adjustment of elevation and rotation using basic hardware. The biggest issue I have with the EQ mount is aiming at Polaris and understanding the misalignment between Polaris and the celestial North pole rotation point. My EQ mount was made about 1985, I have more or less identified it as an early Super Polaris Vixen mount and have had (eventually) a reply from Vixen UK, who confirmed my wiring and they stated the specified payload for this mount is 7Kg, which easily includes my D800 and the Nikkor 300mm f/2.8 MF lens. This is what my iPhone sees through the polar scope. 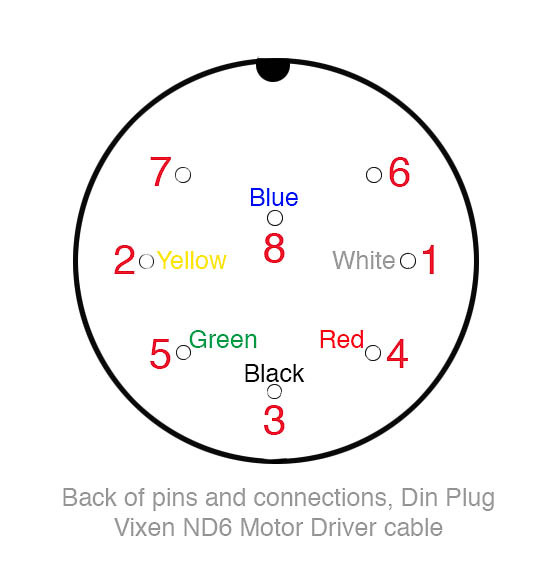 Pinout for the later Vixen MT1 controller connection. I can't get a definitive answer about how the Earth's wobble affects the location of Polaris in my finder scope, I have decided to make the adjustable wedge, then do tests to check polar alignment using the drift method of checking the star drift at 90º increments North and East or West and North as near the horizon as possible, then see for myself where the exact location is in the polar scope. Instead of using a DR-3 angle finder, to enable easier observation through the finder scope I am going to try using my Go-Pro Session cube camera fitted to the eyepiece. I tried it last night and it seems to produce a usable image on my iPad, maybe even able to zoom in a bit. Will try to get a couple of pix of the chunk of metal in the lathe later. Thanks for updating us on your progress, Robert. I do not know if it can be helpful, but there a many applications that will show the location of polaris on a circle for those polar scopes that have that (for Windows PC I have the Polarfinder, Polarisview on my Android phone, both free). The trapezium on your scope would be for the southern hemisphere. Note that the stellar rotation is not exactly 24 hours - it takes 23 hours and 56 minutes according to this page: https://physics.weber.edu/schroeder/ua/StarMotion.html . (I suspect a few minutes off does not matter much, the periodic error of the worm drive has much more impact.) Because of this the location of Polaris on the circle will keep changing with time of day and date. The mentioned apps will resolve that. I am looking forward to see how you will design you wedge.